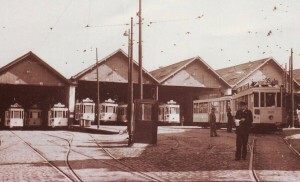 The history of the Woluwe tram depot is closely linked to that of the Avenue de Tervuren. This prestigious artery was envisioned by King Leopold II and built in 1896-1897 by contractor Edmond Parmentier based on the plans of urban planner Victor Besme. Avenue de Tervuren was originally built for the Universal Exhibition of 1897. This exhibition was first planned in 1895 but Leopold II delayed it by two years in order to complete all of its different projects: a colonial exhibition in Tervuren, the actual World Expo palaces in Cinquantenaire Park and a good connection between both of them. However, Leopold II wanted this to be more than a mere road. He specifically wanted a tram between the two sites of the exhibition. Therefore, Parmentier obtained a concession of fifty years for the construction and operation of a tram line running along the avenue. 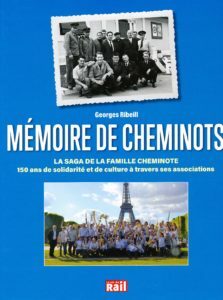 This concession was ceded in 1896 to the “Société Anonyme du Chemin de Fer à Voie Étroite de Bruxelles à Ixelles-Boondael” (BIB). BIB immediately started building the line, which was inaugurated in May of 1897. 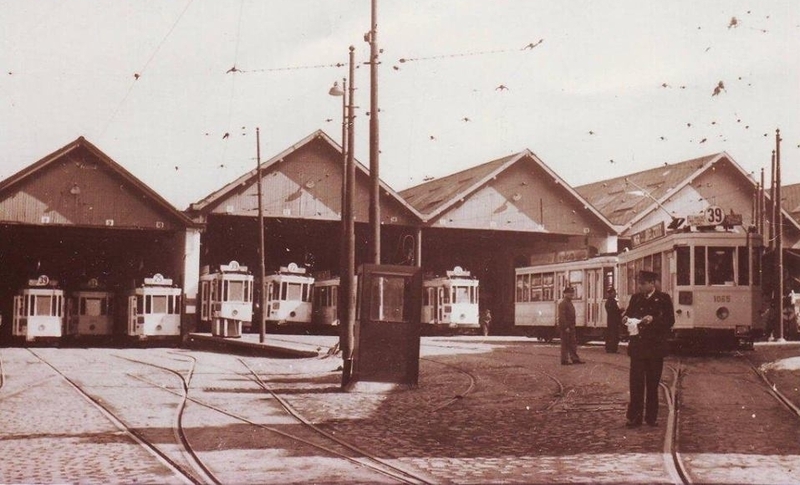 At the time, Woluwe depot only consisted of a single car barn, a small workshop, a power plant supplying the new line with electricity and an administrative building. After the takeover of BIB by the “Tramways Bruxellois” in 1899, the entire network – including the line along Avenue de Tervuren – was re-gauged to 1,435m. This operation was completed in 1903. By 1907/1908 the Woluwe site had developed into a full-blown depot. The surface area of the car barn, used to park trams, had tripled. The small workshop and the power plant were demolished and replaced by two new halls adjacent to the first. These car barn halls were also extended to the Bovenberg. Finally, the administrative building was enlarged and a house for company staff was built along rue Leybeek. The site remained virtually unchanged for several years. In 1941, the back of the first hall was converted to house a staff canteen and new offices, workshops and storage for maintenance workers. A document from 1952 reveals that the Woluwe depot had a total surface area of ​​12,000 square metres and a capacity of 285 tram cars. The total length of its water mains was 3,930 metres. At the time, 14 tram lines were serviced by the depot. In September 1976 the first two halls were gradually abandoned and converted into exhibition halls in order to establish a “Transport Museum”. The first exhibitions were held in June 1977. In 1982, STIB has entrusted the management of the museum to a.s.b.l. MTUB (Musée du Transport Urbain Bruxellois). The first members were mostly staff members of STIB as well as a group of public transit enthusiasts. The site was classified as a historical monument by the Brussels-Capital Region on 29 November 2001. It was completely renovated between 2006 and 2009. Today, the third hall is still an active STIB depot. It houses about 30 trams that serve lines 39, 44 and part of line 94.